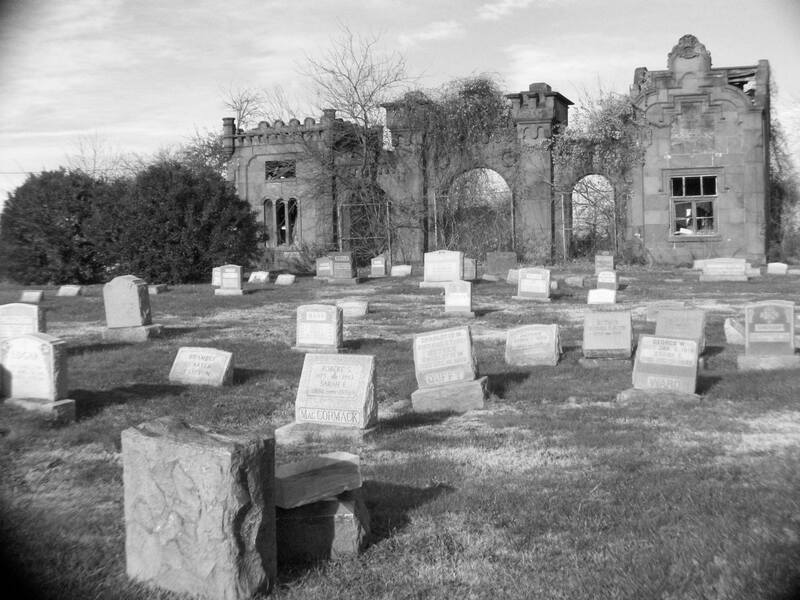 Mount Moriah Cemetery, in the Kingsessing section, is arguably Philadelphia’s most democratic burial ground. The undiscriminating plot is home to many Masons, U.S. Navy sailors, Civil War Yankees, North Carolinian cavalrymen, Philadelphia Muslims, ethnic Catholics, the young, the old, the powerful, the meek. Though its in rougher shape than any other of Philadelphia’s rural cemeteries, being unkempt it’s surprisingly rustic: more woodland than the Woodlands. Founded in 1855 in what was Kingsessing Township, the cemetery hoped to replicate the success of upscale rural cemeteries like Laurel Hill and the Woodlands but for middle class clientèle. As discussed in the Woodlands post above, the popularity of the rural cemetery movement was predicated on changing attitudes toward the dead and public health in the city. Supporters of rural cemeteries feared burial grounds’ fetid miasmas and the prospect of an ignominious eternity in the city’s cramped, poorly drained churchyards. In the act incorporating the cemetery, Mount Moriah Cemetery Association claimed as its guiding principle, “the practice of intra-mural [in city] interments has been found injurious to the health of the living in populous cities and the propriety of providing suitable places for depositing the bodies of the dead in convenient proximity to but beyond the compactly built portion of the town has been fully recognized both as a sanitary and religious obligation….” In trying to differentiate the cemetery from the host of other middle-class rural burial grounds popping up in the mid-19th century, promoters claimed that the cemetery’s distance outside the city meant it wouldn’t be profaned by residential development. ^Mount Moriah has a brownstone castellated gatehouse further west from the main gatehouse at 62nd and Kingsessing. It is fenced in and in severe disrepair. It was designed by Stephen Decatur Button (1813-1897), a contemporary of Thomas Ustick Walter who also designed the first Alabama State Capital. ^According to Edward Shippen’s 1888 article entitled “Some Account of the Origin of the Naval Asylum at Philadelphia,” when the Naval Asylum was constructed in 1827, sailors’ remains in a cemetery located at the corner of Bainbridge and Sutherland (Schuylkill) were moved to “the Naval Plot” at Mount Moriah. 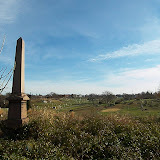 A Pennsylvania Historical and Museum Commission Cultural Inventory indicates the Naval Plot was moved in 1866 and is situated across Cobbs Creek in the northern portion of the Cemetery. ^Mount Moriah is especially significant to Freemasons, many of whom were buried and continue to be buried at MM. [The day we went we observed a Masonic burial.] Thomas Keels has pointed out that many of the second tier rural cemeteries established in Philadelphia profited from institutional alliances with many of the era’s fraternal societies. By associating with the Masonic order, the cemetery profited from “bulk” plot sales. Also, Mount Moriah, being the mountain on which King Solomon’s temple was built in Jerusalem, is integral to Masonic allegory. Look for Masonic icons and gravestones. In the middle of the formal circle in the far western portion of the lower cemetery is a large marble column with the square and compass. ^Civil War soldiers who died at Camp Satterlee hospital (Clark Park) are buried in a prim plot maintained and manicured by the Veterans Administration (??). There are two Confederates (maybe more) buried in the plot with extra-white gravestones. The Civil War plot is near the bridge over Cobbs Creek in the lower cemetery. ^Long stalks of cotton grow throughout the cemetery. ^There is one open mausoleum near the bridge connecting the two cemeteries. ^Take a tour below and choose the “view map” feature to orient you. ^Compared to the disrepair of its actual presence, the Mount Moriah virtual presence is fairly good. You can search for plots here. Great post and photos Chris. I look forward to going through more of the other entries. It was good meeting you last night. I may not have looked in the right place, but I couldn’t find your email on this page. Drop me an email about Tidewater Grain. My email is on my site. Go to the “about” page. Mount Moriah will not give out any information. I wrote to them trying to find out information on two sets of great great grandparents last week and my checks were returned with snippy letters about how they don’t have time to do research. Those people are as arrogant as they are incompetent, IMHO. What do I do now…..how do I find the location of graves and information about who is buried in those lots? I went there in person just last week, to locate the grave of my great great grandmother, Elizabeth Johnson. I have seen on various web pages about Mt. Moriah that there is a woman by that name buried there. She died in January of 1886, and one of my leads from the web indicated that she was most likely in section 210. Upon arrival, we found section 210 completely overgrown with ragweed, honeysuckle, and other weeds over 7 feet tall. I went to the main office for assistance, and the one woman there was very, shall I say, “structured” in her ways of assistance. She was willing to help, however you had to answer her questions on her terms- in her defense I’m sure they get multiple calls and requests, so I’m sure it can get very frustrating. Long story short, I wasn’t able to get anyone to trim the weeds, and I also never found the stone. However, I have seen 2 sources now which indicate Elizabeth Johnson is there, and I am hoping someone can tell me exactly where so I can go back to the cemetery and get pics. Any help would be greatly appreciated!!! I have 24 relatives buried in section 13 at MM. I went in the summer to find them and it was like a jungle. I left covered in ticks. I am going back sometime this winter hoping to locate headstones. I too, spoke with the women in the office. She told me that for $340.00 the cemetery would cut back the growth in the section I am interested in looking at. I tried to ask if the cemetery kept records saying if there was a headstone when a body was moved to MM. She would not answer. All she kept saying was the cemetery would take care of the foliage if I paid. Does anyone know if it is possible to cut through the jungle? This is my only hope to find the birthdate and death date for John Lodge. Many thanks to John Ellingsworth who looked up the interment records for my Fitzgerald and Hubbard ancestors- the 2006 Bulletin news article about the dog kennels actually mentions my great Aunt Maud Hubbard. Astounding miracle to me, and it provided a landmark during our successful 3 Jan 09 visit to Section 44 to find the Family Plot. A real “Indiana Jones” type adventure for the 7 of us who went- wild dogs and digging up grave stones. Very emotional experience kneeling on my great-great grandmother’s grave watching the name appear from under the dirt, broken glass, and other debris. Well, I have my answer before I ask the question. I wanted to visit MM this summer to find a few family graves from 1870 era but I can see that it will be impossible to locate unless I visit the records at Gen.Society. The pictures I’ve seen on this website and others show me that it is a daunting task to find a grave by roaming around. My grandfather, grandmother, mother, aunt and uncle are buried in Mt. Moriah. Fortunately, their grave site is just a few feet from Kingsesing Avenue so the cemetery owner/manager has to keep that section mowed so it looks good from the street. But the farther back you go from Kingsesing the higher the weeds get. The owner/manager of the cemetery obviously sees it as a cash cow. They charged hundreds of dollars for a “foundation” for the headstone of my mother’s grave and all they did was put a couple cinder blocks under the headstone. It never was straight and level. Beside the office building are a couple dozen headstones that haven’t been placed yet. I wonder if they even bother placing them now unless a family member shows up and complains. When they buried the urn with my uncle’s ashes they only dug down a couple feet and the top of the concrete box the urn is in is now visible through the grass. It causes heartache for my father to see this cemetery that is the burial place of many Congressional Medal of Honor recipients and other notable Americans being so neglected. The formerly beautiful mausoleums have all been vandalized. The metal doors and windows hauled off for sale to scrap yards. Hundreds of headstones have been pushed over and broken. It’s a disgrace. I don’t know why the city government allows it to be this way. There’s dead people buried on me! Have we determined who owes this Cemetery? Then can we do anything about the condition???? I called 1-215-729-1295 and received information on my great, great Uncle’s Civil War Plot No. 78. The gentleman was very polite and helpful, although he did not know what efforts were going to be made to upgrade the site. I have my grandparents buried at Mount Moriah, we called yesterday and the cemetry is closed for business. The local City Council person is aware of this and a friend of mine who is a funeral director believes that the cemetry probably will be sold to a new ownership group who hopefully will maintain the place. If anyone is looking for assistance on the grounds of the cemetery, I may be able to help. I am a concerned neighbor who has aided others with hunting done their relatives burial area in the cemetery itself. I also have associates with the capabilities of accessing a lot of the section and plot numbers for various people buried here. Email me at mountmoriahhaunt@yahoo.com. Looking for date of death for a loved one? The Pennsylvania State Archives has opened the death indices for 1906 through 1961. If the link doesn’t work, go to the website for the Pennsylvania Department of Health, select birth and death certificates; when that section ops, click on the highlighted text Senate Bill 361. A new window will open, select the highlighted “death” and get searching. A number of years ago my father stopped at MM while passing through Philly to find his father’s grave and to see if other relatives may be buried there. The cemetary then and now is in such bad condition that he couldn”t find the grave even though he knew where it should be. I don’t care what the laws are that I’ve read about, but the City of Philadelphia should be ashamed of that this cemetary has reached this condition. I would think that the city or state would have some type of legal means to take possesion . If not then legislation should be introduced at the state level to allow that to happen. What is happening at MM today? Has it been sold? Has it been cleaned up? Thanks to the dedicated men and women who have stepped up and began to clean this beautiful old cemetary. God bless you all. To the Friends of Mount Moriah, “thank you so much” for all of the wonderful people who have stepped up to save this historic cemetary. My wife’s family is located in the front, on the right side of the entrance and my family is on the other side of Cobbs Creek in section 125. I am not sure is it is possible to grove up the hill to that section. I would love for someone to let us know that we might visit. Remarkable! Its genuinely awesome piece of writing, I have got much clear idea regarding from this article. I know this website presents quality based articles or reviews and other stuff, is there any other web page which gives such information in quality? I blog quite often and I genuinely appreciate your content. This article has really peaked my interest. I will book mark your site and keep checking for new information about once per week. I subscribed to your RSS feed as well. That is a great tip especially to those new to the blogosphere. Simple but very accurate information… Thank you for sharing this one. A must read post! Hi to every body, it’s my first go to see of this weblog; this website contains amazing and actually good stuff in favor of readers. It’s really very difficult in this busy life to listen news on Television, so I only use world wide web for that reason, and take the most recent information.